When I found out that I would be receiving an advance copy of a motorcycle racing game called Tourist Trophy for review, I was understandably excited. After all, the game was developed by the same team that created the popular Gran Turismo auto-racing series, which is without a doubt my favorite video game of all time. As a dedicated Gran Turismo player since the very first version of that game was released about 5 years ago, I was anxious to see how the combination of my two obsessions (motorcycles and Gran Turismo) would play out. Tourist Trophy didn’t dissapoint – indeed, it turned out to be even better than I had anticipated. The game strikes a perfect balance between being easy enough to learn quickly, and challenging enough to hold your attention. Gran Turismo veterans will be immediately familiar with the format of Tourist Trophy – which features both an arcade mode (including two-player battles) and a ‘career’ mode. The arcade mode is the simple way to jump quickly into the game, allowing you to pick from most of the game’s 100+ bikes and 35 courses when setting up a race. However, those who try to head directly for the ‘racing modified’ 1000cc superbikes will be in for a rude awakening – it’s best to use the career mode to build up your skills little by little before trying to control these hyper-fast machines. 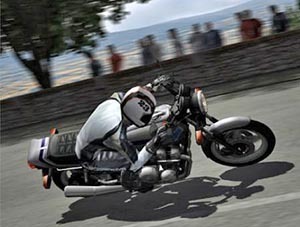 The career mode is very similar to that of Gran Turismo – you start off with a basic bike (actually a small-displacement scooter), basic gear, and access to only a few races. To earn your chance to access more challenging races and faster bikes, you have to pass a series of ‘License Tests’ – there are four licenses in total, and each one can only be earned by completing ten challenging tests within a certain time limit. The most notable difference between TT and GT is the way you earn new machines. 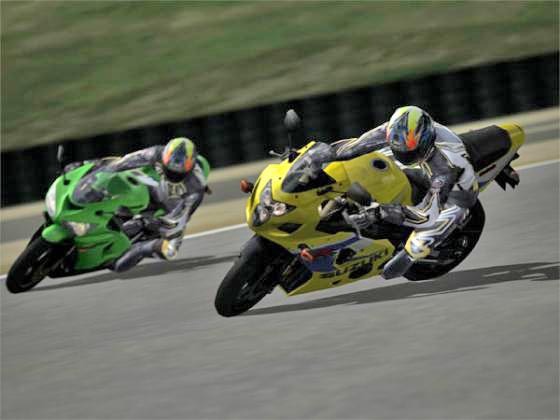 In Gran Turismo, winning a race or race series meant winning a new car, and the same is true with bikes in Tourist Trophy – how cool and how fast the bike is that you receive depends on how challenging the race is that you won. However, winning races in GT also earns the player money, which could be used to purchase new cars at the dealership, or to purchase new modifications for your existing cars. You can still visit the dealerships in Tourist Trophy – the difference is, instead of buying a bike, you have to win it by competing in a short race where you ride the bike you are trying to win, and challenge other riders on the same or similar bikes. That brings us to basically the only thing about Tourist Trophy that dissapointed me – the lack of modifications. Not that you can’t change the setup – you can adjust everything from brake balance to suspension damping to gear ratios, as well as being able to control your racer’s ‘form’ (his body position on the bike) with a bewildering array of sliding tabs. But I had hoped to be able to start with a stock streetbike and slowly add modifications like exhaust, engine tuning, race bodywork, etc. until it had morphed into a full-on racing machine. Instead, you are stuck with riding either street bikes or ‘racing modified’ machines – most popular bikes are available in both forms, but no option for gradual transformation exists. Still, you will forget that dissapointment as soon as you start your first race. The graphics aren’t what I’d call incredible, but they’re certainly impressive enough – at least on a par with the last installment of the Gran Turismo series (#4), and perhaps even slightly better. 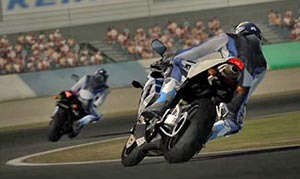 The rider’s movements on the bike are smooth and natural-looking, and the whole appearance of the game is very realistic. I wouldn’t say that the game’s response to every situation and input is completely realistic (for example, in slower turns you can slam on the brakes while at full lean without crashing), but overall the experience of riding a motorcycle is replicated with extreme accuracy. The controls are intuitive and easy to pick up, and within an hour of opening the box I was carving corners, pulling wheelies, and dicing with my computer-controlled opponents as easily (or maybe more so) as I would in real life. I was starting to get pretty confident on the ’80s Japanese two-stroke 125s and four-stroke 400s that I had won early in the game, so I decided to try stepping up to the bigger machines. However, as I mentioned earlier, the faster a bike is, the more difficult it is to win – a fact that was really driven home when I headed into the ‘challenges’ section in an attempt to get my hands on one of the latest 600cc supersport bikes. It took me quite a few tries, but I finally won a 2005 Honda CBR600RR – and the reward was all the sweeter because of the difficulty I had attaining it. Now, I’ve had my copy of Tourist Trophy for a few weeks, and I just recently beat the tests for the third racing license, which is the one which opens up the chance to challenge for the first level of ‘racing modified’ machines – which includes 600cc supersport bikes, 250cc two-stroke GP machines, and even some big 1100cc+ naked bikes, which apparently have their own very popular racing series in Japan. So after approximately 30-35 hours of playing time, it seems I’ve barely scratched the surface of Tourist Trophy – I still have another license to win, which should open up more tracks and races, along with the very highest level of racing machines available in this game (I’m expecting 1000cc superbikes and similar endurance-racing machines, like those run in the Suzuka 8 Hour race). What’s the bottom line? Tourist Trophy is as close to perfect as any motorcycle game has ever come, and is literally light-years ahead of any of it’s competitors as far as realism, graphics, and entertainment value. If you are a motorcycle enthusiast with a Playstation 2, this will be the best $39.99 you ever spent – heck, if you dont’t have a PS2, you should consider buying one just for the chance to play Tourist Trophy! The only drawback I can see is the possibility (maybe I should say certainty?) that you will get completely addicted to this game, to the point of staying up late, waking up early, and getting in trouble with your significant other – just to win that next race!